Some easier, simpler sections coming up here, the first of which are my two home goals for 2014. Last year, I organized our life. We took over ten boxes to the Goodwill and threw out countless trash bags of useless un-recyclables. 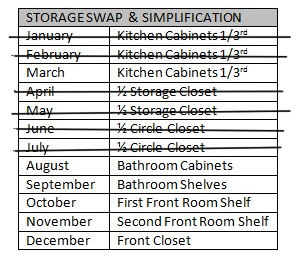 This year, I want to Simplify our home. This is incredibly similar to organizing, but it means actually going through all of the important annotated boxes that I usually just stack away and throwing things out. It also means swapping those cardboard boxes to Tupperware boxes or drawers so I can see what the heck is in them in the first place. Boxes fall apart, get moldy and can even color older paper. Tupperware is the best way to go for storage. On the bright side, this is a topic I tackled at the beginning of the year and have actually been working on! Let me take the original list from January and cross off what's already been done! This might be the one thing I'm actually pretty ahead on this year. Proof that I'm a Virgo and OCD. So let's plug these goals into my goal chart! 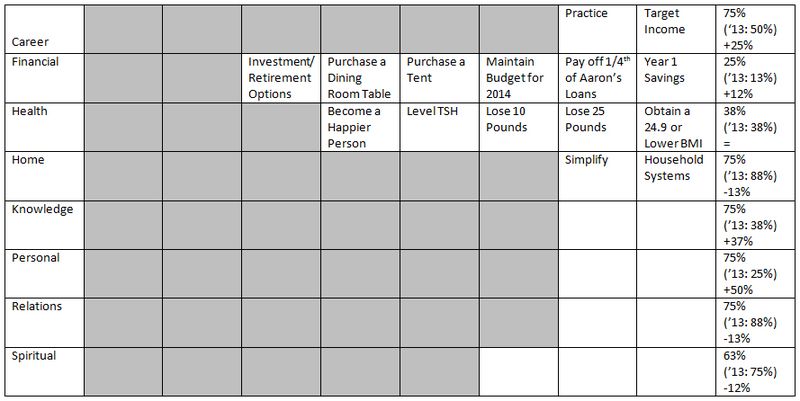 And, while we're at it, let me put up the monthly goal template for Home. Simplify _________. – 0% complete. Create [insert Household System]. – Done | Note Done – 0% complete. Use [insert Household System]. – 0/X Days – 0% complete. What are your 2014 home goals? How are you so organized?! *is jealous of your goal-making organization skills* I am really liking these goal posts. They are really inspiring for getting into the specifics that need to get done in order to accomplish big things. Thank you so much! I blame my organizational skills on my Virgo II OCD personality, lol. I'm so glad you're enjoying these and that they're just not bombarding everyone with an overwhelming number of tables and lists. If I've inspired or motivated just one other person, I've done my job as a blogger!